What made the experience of listening to Future Crimes the most enjoyable? What was one of the most memorable moments of Future Crimes? 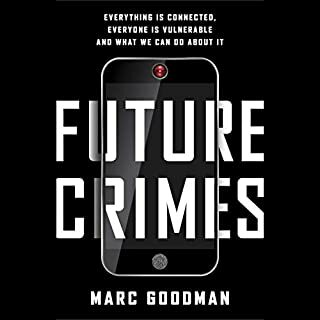 The author begins Future Crimes talking about some of the most famous data thefts where big corporations have been targeted. He demonstrates, not only private and public entities are their targets but also, individual are not safe. Author gives a detailed account of how a Wired journalist was targeted and lost control of his iPhone, iPad, and almost everything that was connected to these devices. He points out that with changing social dynamics, people are increasingly becoming comfortable to share critical information about themselves on the social networks. This information is very instrumental to target them and their loved once for all kinds of minor and major crimes. Moreover, it is not just the attackers that we need to be wary of. It is also the social media corporations and (so called) legitimate agencies who uses our information shared in good faith for profits and often against us. Particularly, in You’re Not the Customer, You’re the Product, his example of the PatientsLikeMe website will rob you of all the belief that you have placed on forums and networks as related to the privacy of the information you share on sites like these. The author narrates an example where all the patients’ information about their experiences and illnesses were mined by an unauthorized Nielsen company bot, which could be later sold to insurance companies that will decide your premiums based on the ‘confidential’ information and make numerous other decisions about the service and offers you receive. Big data can bring you the best of products and help companies come up with just the solution you need. But this same data can kill you, literally. The 2008 Mumbai terrorist attack was unique because the attackers used real-time data compiled from multiple sources. Updates that people like you and me shared, helped orchestrate one of the most violent and prolonged terrorist attacks in the world. Technology brings new and exciting ways to make our lives more efficient and easy. But it also provides as many ways to make it miserable. From vulnerable online banking to smart homes that could be hacked and controlled at whims of a teenager sitting thousands of miles away, everything connected to the grid is exposed to an attack. Electric grids, water treatment plants, Dam gates can be accessed and attacked with devastating results – remember the Fire Sale concept in Die Hard 4? It is not just fiction, there is a possibility of that happening. All the information in the book is true. But the author tells these horrifying stories in a style befitting a thriller. You will read about the crimes that you have read in newspapers and about those that never surfaced in the public glare. You will read about crimes that are waiting to happen. Are you thrilled about the new app that controls your house temperature and warm it before you reach home on a cold afternoon? Well, be also aware that this same technology can be used to start a fire and prevent to fight it in time. He makes his points well, how Internet of things, (nano) robotics, steatites, cognitive computing, advanced medicines, 3D printing and many more of new age technologies are not only enabling normal individuals for more convenient lives but also making is a matter of convenience of freaks to launch an advanced attack against the entire humanity and our planet. Nuclear bombs may the most devastating discoveries in past which can be used to wipe-out the entire human race however, nations need to accept the hard reality, any of the above new technologies can be used to result similarly or may be worse devastating effects on our planet. It is time to make a yet another non-proliferation treaty to restrict the misuse of these technologies. Throughout and in the concluding chapters, the author has proved promising ways and options for all of us to be able to avoid the discussed technology abuse and disasters. At one point, the future may look very grime due to these technologies, the author explains, the choice is in all of our hands to overcome yet another watershed moment for humanity by acting responsibly rather than short-term greed. 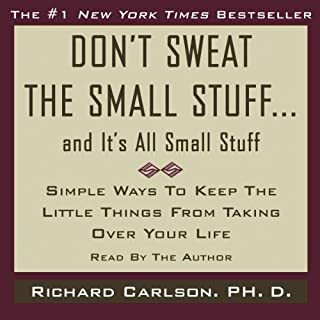 Would you listen to Don't Sweat the Small Stuff, and It's All Small Stuff again? Why? Which character – as performed by Richard Carlson – was your favorite?